SEATTLE — Globally, smoking prevalence — the percentage of the population that smokes every day — has decreased, but the number of cigarette smokers worldwide has increased due to population growth, according to new research from the Institute for Health Metrics and Evaluation (IHME) at the University of Washington. The study, “Smoking Prevalence and Cigarette Consumption in 187 Countries, 1980-2012,” was published January 8 in the Journal of the American Medical Association in a special issue devoted to tobacco. Overall, age-standardized smoking prevalence decreased by 42% for women and 25% for men between 1980 and 2012. Four countries—Canada, Iceland, Mexico, and Norway—have reduced smoking by more than half in both men and women since 1980. But substantial population growth between 1980 and 2012 contributed to a 41% increase in the number of male daily smokers and a 7% increase for females. In 2012, smoking prevalence among men was higher than for women in all countries except Sweden. More than 50% of men smoke every day in several countries, including Russia, Indonesia, Armenia, and Timor Leste. Smoking prevalence for women was above 25% in Austria, Chile, and France and higher than 30% in Greece, among the highest percentages in the world. The lowest smoking rates for men can be found in Antigua and Barbuda, Sao Tome and Principe, and Nigeria. For women, smoking rates are lowest in Eritrea, Cameroon, and Morocco. These differences persist despite decades of strong tobacco control measures globally. Fifty years ago, the first US Surgeon General’s report on the health impact of smoking led to groundbreaking research on tobacco and investments by governments and nonprofit agencies to reduce tobacco prevalence and cigarette consumption. In 2003, the Framework Convention on Tobacco Control (FCTC) was adopted by the World Health Assembly and has since been ratified by 177 countries. According to the most recent figures from the Global Burden of Disease (GBD) study, coordinated by IHME, tobacco led to 5.7 million deaths, 6.9% of years of life lost, and 5.5% of total health loss around the world. These estimates exclude the health effects from secondhand smoke. 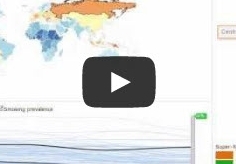 IHME arrived at its estimates based on a wide range of data sources, including in-country surveys, government statistics, and World Health Organization data. Previous estimates typically have been focused on fewer data sources. The greatest health risks for both men and women are likely to occur in countries where smoking is pervasive and where smokers consume a large quantity of cigarettes. These countries include China, Ireland, Italy, Japan, Kuwait, South Korea, the Philippines, Uruguay, Switzerland, and several countries in Eastern Europe. The number of cigarettes smoked around the world has grown to more than 6 trillion. In 75 countries, smokers consumed an average of more than 20 cigarettes per day in 2012. There have been three phases of global progress in reducing the age-standardized prevalence of smokers: modest progress from 1980 to 1996, followed by a decade of more rapid global progress, then a slowdown in reductions from 2006 to 2012. This was in part due to increases in the number of smokers since 2006 in several large countries, including Bangladesh, China, Indonesia, and Russia. 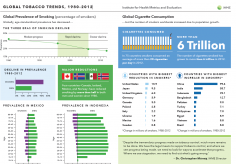 Annualized rate of change captures the relative reduction in smoking prevalence, and several countries had notable declines of 2% or more between 1980 and 2012. For men, annualized rates of decline of 2% or more occurred in 17 countries, with the greatest rates of decline observed in Canada, Iceland, Mexico, Norway, and Sweden. For women, annualized rates of decline greater than 2% were achieved in 22 countries. Bolivia, Canada, Denmark, Iceland, Israel, Norway, Sweden, and the United States all had prevalence rates in 1980 higher than 20% but achieved annualized rates of decline of greater than 2%. In a disturbing trend, Austria, Bulgaria, and Greece all had prevalence rates greater than 20% in 1980 and have shown statistically significant increases since then. Which countries had the highest and lowest smoking prevalence for men in 2012? Which countries had the highest and lowest smoking prevalence for women in 2012? Which countries where smoking prevalence was greater than 20% in 1980 had the fastest declines and the biggest annual increases between 1980 and 2012? In terms of number of cigarettes, which countries with populations greater than 1 million had the highest and lowest average consumption per smoker per day in 2012?